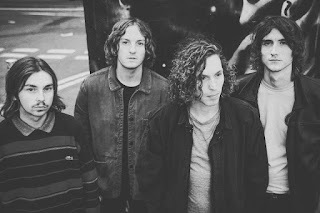 Dantevilles look set to be one of the next bands to break out of the local scene in Manchester. Already with a record deal under their belt, their first national tour just behind them and their biggest hometown show in the offing in June as well as the patronage of the likes of Blossoms and This Feeling and a big response to their last single Graffiti, they're set to hit the festival circuit this summer and play to much bigger audiences. We had a chat with them ahead of their performance at Heaven On Earth at Halle St Peters in Manchester on Saturday about their plans. First of all, could you introduce Dantevilles please? Dantevilles came together when Jamie, Paul and Connor all moved in together in Moss Side, Manchester, 2014. Looking for a drummer to make the band a whole, we called a friend in Blackburn and through Pete Eastwood we gave Cory a ring. Immediately the sparks started flying once we started jamming and we’ve never looked back since. You've recently signed to Heist Or Hit and released latest single Graffiti with them? Did that feel like a big step-up releasing through a label with a network rather than doing all the leg-work yourself? We’ve been doing the leg-work ourselves since we first started the band and still are now; but to have help from a label who are as confident enough in our music as we are, then to sign us up and use their contacts to push it as well as our own, it means a lot. Graffiti is constantly gaining recognition and it’s only a positive to when we bring out another single. You've been introducing new songs into the set recently. Are you at the point where you've got an album ready to go or is the plan to keep releasing singles for a little while longer? We’re glad you’ve noticed that there’s new songs in there, because the audiences have noticed them too and you can hear that they like them. We’ve been getting huge cheers after playing the new ones (sometimes for the first time) at a similar level to when we play the singles everybody knows. It’s quite special when a song you’ve just written gets an uproar from a crowd that have never heard it before, it just means you’re getting better and better. We’re sticking to releasing singles at the minute, it’s not the right time to bring out a debut album. When you write new songs, does one of you bring them to the band or do you write together? How would any song be written if someone didn’t have an idea to begin with? Of course someone always brings the initial idea to the table, but then we all write and finish it together. It wouldn’t feel like a band if we didn’t all have a say and an opinion, it’d feel like an army. Some take a while, but usually we agree pretty quickly and crack on with another straight away. We like to get creative with it all too, that’s what music’s all about. For example; we thought we’d write Graffiti from the drums upwards for a change and it helped us all pick out the parts we wanted to use in a completely different way. And how do you decide which one of you sings lead vocals? Are there any songs you've fallen out over who does? We fall out every second, every minute and every hour of every day over who sings the lead vocal! No, in all honesty we don’t fall out at all over it because we both know that the other person can sing the line just as well as the other. Jamie and Connor have different timbres in voice and when sang in unison it gives a really unique texture to vocals. We’ve developed a call and response effect we’re using a lot now, one person sings a line then it quickly swaps to the other, it’s a neck workout on the microphone to say the least, but we love it and the crowd loves it. Your audience has been steadily growing. Are there any particular memories or gigs where you've thought "this is it, we've got a chance of really making it now"? Apart from all of them? Yeah, there’s been a lot actually. In recent news, the two sold-out gigs at Jimmy’s, Northern Quarter gave off a feeling of atmospheric accomplishment. We put them gigs on ourselves and sold them both out ourselves, one in only thirteen hours. When you can stop your song completely and the crowd sing the words back, that answers the question. Another could be playing Leeds Festival to a packed out tent with complete strangers from all over the world dancing to your music in a field, covered in sweat and mud and not caring in the slightest. You played some shows with Blossoms last year and they've been big vocal supporters of you. They were regulars on the circuit you've been playing recently. Has what they've achieved set a bar for you in terms of how far a band can go? The Manchester circuit is a hard one to get on, but once you’re in it, more and more people take notice and you can feel it. Tom first saw us at Night & Day and loved what we were doing, then personally asked to support them on their album launch at Stockport Plaza and twice at Gorilla. Well, it gave us an insight into what it can be like. Every band makes it their own way, don’t worry, we’ll be there one day. Recently you've been off round the country playing your first tour. How did you go down in places you'd not visited before and was it a challenge going out and playing to a room full of strangers rather than familiar faces back in Manchester? We rehearse for long hours and very frequently so it’s never a challenge getting on stage and playing to strangers, it’s more of a buzz. Glasgow was unbelieveable, the reaction we got was next level, to the point of getting more money and a big crate of beers from how well we got received. It felt a bit strange being called Southerners, that was hard to get your head around. When we did go down south, the Southern crowds loved us, not just for the accents, they loved our fresh sound we brought down with us. We’re not unfamiliar to playing London and every time we do, the crowds get bigger and better. You're playing Heaven On Earth at Halle St Peters in Manchester on Saturday, what are your plans after that for the summer and beyond? The second time we’ve played in a church, once in Blackburn and now in Manchester. We hope God’s alright having us in his home again, there’s no swearing or blasphemy in our tunes, so we hope he’ll be alright. Spring’s only just begun and now you’re asking about Summer? We’ve got Blackthorn Festival and Hope & Glory Festival to name a few, but the big one’s our headline show at Sound Control on the 3rd June with SJM. After Halle and a little secret at Night and Day, that’s the main focus, getting that gig as rammed as it possibly can be. Last question, if you had to describe your sound to someone who'd never heard you before, where would you start? It's always a tricky one describing our sound and tying it to a genre, as we simply can't. Nobody can put a finger on our sound, but they know it's familiar to Indie. We're Indie with catchy hooks dotted all over the place. Some might say Indie Pop, but that genre just doesn't have that extra something, there's no X-factor to it. To use a genre which is full (Indie) and not cut up into sub-genres makes sense. Dantevilles are on Facebook, Twitter and Soundcloud. They play Heaven On Earth at Halle St Peters in Manchester on Saturday April 22nd and headline Sound Control on Saturday June 3rd.